So the G8's latest climate change deal is a steaming pile of crap. Canada, the United States, Japan, Russia, Britain, Italy, Germany and France have agreed to try to halve worldwide emissions by 2050. I mean, hey guys, let's not knock ourselves out, right? By 2050 aliens will have arrived with their superior technology to help us out of this jam, surely! Why no mention of the aliens, Antonio? Gah, what's with the negativity? Anyway, Canadians don't have anything to worry about because our nation topped the list of countries best equipped to endure climate change in a recent British study. 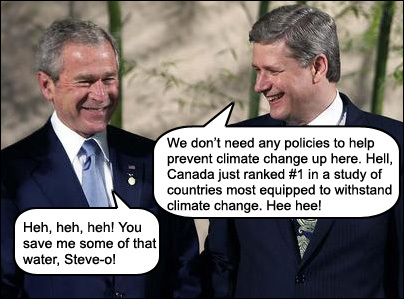 Hmm, maybe this explains Stephen Harper's underwhelming dedication to battling climate change. We're sitting pretty up here. All you poorer nations can just wait for that alien rescue ship (it's on its way, really! )—us, we're going to sit back and enjoy some cool ones by the lake. It's *so* nice this time of year.